Note This is an abstract for a talk presented by M.A. Hills at the workshop. This work is an extension of the work on RLSRunner. The address of the Cheile Gradistei, Moeciu Complex is Drumul Carului, Moeciu, Brasov, Romania. Hills, M.A, Klint, P, & Vinju, J.J. (2011). 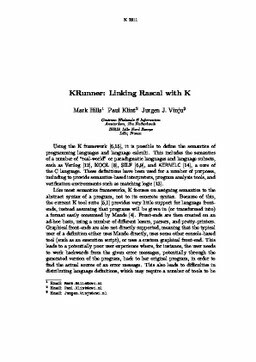 KRunner: Linking Rascal with K.